KAWASAKI’s Z900 has such an iconic heritage that it could be held responsible for more wet dreams in the 1970s than Debbie Does Dallas! The cult following spawned around the world thanks in-part to what we take for granted today: an inline four-cylinder engine with double overhead cams. The Z1 (as it was known) of 1972 was the first consumer-produced sportsbike to feature this technology, claimed to produce 82 brake horsepower and had a top speed of over 200km/h. In Australia, we have a bunch of rogue filmmakers to thank for further propelling the status of Z900… Get the right people talking about this machine, built some 45 years ago, and to this day you will find it hard getting them to shut up about it! In 2017, the new Zed-9 is a fair departure in style from the early UJM machine with its angular stance and it currently occupies a neither here, nor there place in Kawasaki’s 2017 catalogue. While it replaces the Z800 of 2016, you will still see it parked next to the Z1000 on showroom floors across the country. To an untrained eye both the performance and style of the Z900 and Z1000 seem to be pretty close to each other. This leads one to question, has Heavy Industries HQ made a big mistake by not tipping their cap to yesteryear with a modern interpretation of its revered retro? It seems to be the thing to do currently and Kawasaki is certainly late to the party in that respect. In saying that, Kawasaki could well deserve high praise for being ballsy and sticking to its guns. It know what works and it know how to build a high-performance motorcycle well. Why do anything different? After to-ing and fro-ing I still think the Z900 really needs to separate itself from both this and last year’s large-capacity machines to sell well. So let’s take a look at it. The 948cc inline four-cylinder engine is down 95cc compared to the Z1000, which is due to a smaller bore, but the engine achieves the same compression ratio of 11.8:1. Press material shows the power delivery being quite linear, the Zed-9 produces a claimed 125 horses at 9,500 and 99 Newtons at 7,700, which is down 12.5 per cent on power and 10.8 per cent on torque on the big Zed. Theoretically it should be a bit easier to ride on the road, and the Z1000 is great to ride on the road. I expect it should provide more bang for buck in that sense. While it will still be a ‘top-end screamer’ of sorts, the output figures mean riders looking to upgrade from middleweights and supersport 600s shouldn’t find the output too intimidating despite the engine capacity being near enough to 1000cc. Experienced riders coming from a big bike with a host of technology (and never using it) will relish Kawasaki’s ballsy attitude to rider modes and traction control. On one hand, it’s 2017 and Kawasaki has developed great safety technology. Why not use it? 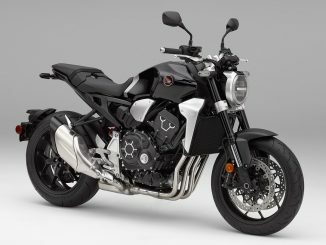 In 2017 the Z900 receives some significant updates over the model it replaces, namely a new trellis frame which uses the engine as a stressed member. It’s 21 kilos lighter than the 2016 Z800. A new swingarm also contributes to weight saving – in the all-important unsprung area, and handling should be improved as a result. The bike has also received a major update in style, without compromising the aggressive silhouette and imposing aura that Kawasaki dubs Sugomi. There’s a Z pattern LED tail light first seen on this year’s Z650L and if it doesn’t do it for you, I don’t know what will. The trellis frame is an obvious departure in style from earlier twin spar models and I really like the statement Kawasaki has made by painting it candy lime green. There’s new instruments which have three different display modes which cycles through different tachometer styles (needle, bar and hybrid), a gear position indicator, and a programmable shift light. The wheelbase is slightly shorter than the Z1000, it has the same rake but a few millimetres extra trail, a smaller 180-section rear tyre, lower seat height and it weighs 11 kilos less. Brakes and suspension are different too, the Z900 receives slightly lower-spec components, but radial-mount calipers and stepless adjustment would be overkill for the somewhat milder performance. When you open the taps, you have sheer excitement not only in your hands, but in your ears too. The Z900 is the second bike from Kawasaki which has been designed with its intake howl in mind. Hearing the engine spin up the point where 99 Newtons force 125 ponies to dance is a uniquely Kawasaki experience and something to behold. I can’t fault the way the bike steers, 24 and a half degrees of rake and 103mm of trail is a nice balance between agility and stability. It tips into corners confidently and picks up well. Providing a bit more trail over the Z1000 while taking some rear tyre width away is a good counter-action, though it could cause problems in rear traction or front end stability depending how hard you ride. In the city, low speed handling is great: U-turns and lane filtering are a cinch. Weight management and steering geometries are spot-on. Big capacity nakeds tend to have pretty stiff uncompromising suspension and while and the Zed nine is on the firm side, I found it to work pretty well. During the 1000+km of riding, I took the bike on tour for three days over some of Australia’s best and worst roads. The front complied with every change in surface, while the rear shock took the harshness out of the bumps, and boy were there a few of them. Both the front and rear are preload and rebound adjustable. I did find a potential issue with the rear shock however. The rear preload was at its softest setting from the factory. I weigh about 110 kilos and static sag was pretty close to perfect for my weight. This could be bad news for anyone who weighs less because the rear spring will be too firm for rougher surfaces and not have enough extension available in the shock’s stroke. Pulling the bike up are two four piston calipers on 300 mil petal discs. They aren’t the strongest stoppers on the market but they are matched well for the Zed-9’s output. Initial bite is strong and brake feel is excellent through the adjustable lever. ABS is standard and it engages positively. The riding position is slightly forward and into the wind, I found the seat-to-‘peg distance pretty good, same with the seat-to-‘bars. Everything falls to my hands and feet nicely, but I think Kawasaki can slightly improve the bike here too. The seat could do with a bit more padding, the sidestand could be easier to locate and the pegs felt a bit slippery in the wet. So I hear you asking, is that all that’s wrong with the bike? Besides ABS, for a large-capacity machine to be without any major safety package by the way of electronics in 2017 is puzzling. I think it puts the bike in a precarious position when you consider the overall quality and fierce competition in the sub-$15k big naked segment. For those without the talent – while the bike is really easy to ride – there may be the thought in the back of your mind – don’t push the bike too hard or lose your concentration. It has the capability to bite you on the bum. Does the bike need rider modes? Nope. The engine is so tractable I had no hesitations even riding in the wet. Riding it is the easiest way to understand why Kawasaki hasn’t added rider modes just for the sake of it. They would be arbitrary. Does the bike need rider aids? Not really… and therein-lies the issue I have trouble getting past. Although no bike should ‘really’ need rider aids, is ‘not really’ good enough nowadays? I think switchable traction control would take the Z900 to the top spot in the under 15k big naked segment, purely because it would make the bike much more suitable for a wide range of riders. However I completely get that there are riders who like their bikes to be ballsy, so part of me really loves the fact Kawasaki has the cojones to make this bike the way it has. People should have the choice to buy an all-out street machine and do whatever they damn-well want with it. If wobblers don’t know where the limit is, do they even deserve to ride a bike with such a legendary status? Fortunately the answer is ultimately up to you, dear reader and/or potential buyer. At the end of the day there’s absolutely no denying Kawasaki has delivered us an exhilarating naked machine and it’s remarkably easy to ride fast or slow. At $12,499 plus on-roads the Z900 offers the best engine you’ll sample on a big naked under $15,000 and plenty of bang for buck across the board. It may not have the same list of features as some others but it’s so close to being that good it doesn’t need them. What tail pack did you use, and how did you attach it? I just bought myself a Z900 and have yet to figure out the optimum luggage solution. That short tail doesn’t offer many tie down points. I find the stock seat too hard and scalloped for a 6′ rider. The taller comfort seat has a much better flat profile. My right heel rubs on the exhaust heat shield every now and then. Not a huge issue and not as bad as a Ducati Monster, but it’s noticeable. I think the fuel delivery is close to perfect. No need for any secondary fuel maps or rain mode. Yeah I know what you mean. That tailpack wasn’t ideal for the bike but I had to make it work for the trip but it got the job done! Yep that engine and fuelling is sublime – such a joy to ride! Enjoy.